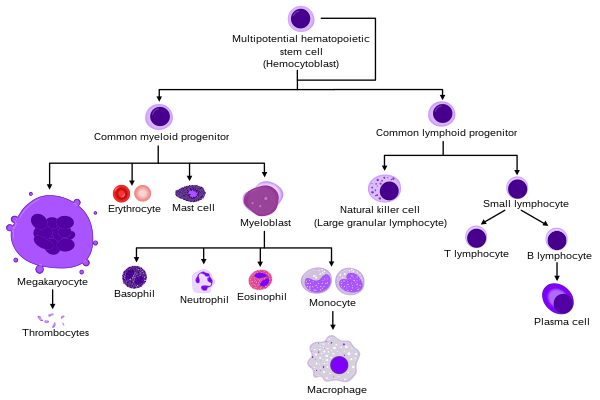 Hematopoiesis (or haematopoiesis; sometimes also haemopoiesis) is the formation of blood cells. In a healthy adult person, about 1011–1012 new blood cells are produced daily to keep steady state levels in the blood circulation. Hematopoietic stem cells (HSCs) or hemocytoblasts are the stem cells that give rise to all the other blood cells. The process is called hematopoiesis. They are in the core (bone marrow) of most bones. As a stem cell matures it undergoes changes in gene expression which limit the cell types it can become. It moves closer to a specific cell type (cellular differentiation). These changes can often be tracked by monitoring the presence of proteins on the surface of the cell. Each successive change moves the cell closer to the final cell type and limits its potential to become a different cell type. HSC studies through much of the past half century have led to a much deeper understanding. More recent advances have resulted in the use of HSC transplants in the treatment of cancers and other immune system disorders. ↑ 1.0 1.1 Birbrair, Alexander & Frenette, Paul S. 2016. "Niche heterogeneity in the bone marrow". Annals of the New York Academy of Sciences 1370: n/a–n/a. doi:10.1111/nyas.13016. ISSN 1749-6632. http://onlinelibrary.wiley.com/doi/10.1111/nyas.13016/abstract. ↑ Parslow,T G.; Stites, DP. ; Terr, AI. ; Imboden JB. Medical Immunology (1 ed.). ISBN 0-8385-6278-7. This page was last changed on 15 July 2016, at 09:40.